Jane Craig (Holly Hunter) is a news producer who is very good at her job but also has daily emotional breakdowns. She works closely with brilliant and cocky reporter Aaron Altman (who’s in love with her), but when handsome news anchor Tom Grunick joins the network, she can’t help but pursue him despite the fact that he does not share any of her ideals about what news should be. I don’t think that’s a very good description of the movie, but I’m not sure I can do better – this movie is just about the interaction of Jane, Aaron, and Tom until external circumstances make it impossible for them to work together, set in the background of a changing news landscape. The only other James L. Brooks directed movie I’ve seen is Spanglish, and judging by both these movies, he’s one of my new favorite directors because he makes great movies about real, ordinary people interacting with each other. The only other director that I can think of who consistently has such identifiable women is Sofia Coppola. 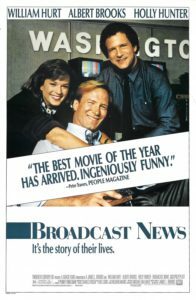 Broadcast News was apparently nominated for seven Oscars, and that makes total sense to me. Holly Hunter, Albert Brooks, and William Hurt all put in amazing performances – very few movies make you feel like you know characters as well as these ones. I also thought the conclusion of the movie was satisfying and realistic. I wasn’t sure what to expect from this Australian movie described as “Unforgiven with a sewing machine”. Kate Winslet stars as Myrtle “Tilly” Dunnage, an expert dressmaker who returns to her childhood home of Dungatar after a long absence. She’s bitter since she was accused of murder as a child and driven out of town, but tries to set up a business since she needs to take care of her sick mother. But people in small towns can be utterly unforgiving, and she doesn’t find it easy. At first, you think this is the kind of movie where a stranger moves into a small town and they’re quirky but eventually change everyone’s lives for the better. Tilly’s dresses make people look fabulous and turn the fortunes of a few women around. 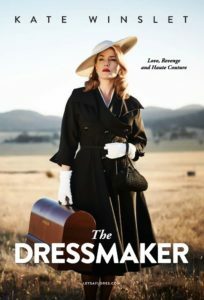 But The Dressmaker is actually a black comedy, and subverts a lot of those tropes. I don’t want to say more – it’s best experienced for yourself, but not only was this a better movie than I thought it would be before I saw it, it was way better than I thought it would be even midway through the movie. Professional gambler Bret Maverick is a few thousand dollars short of the money he needs to enter a one-of-a-kind high stakes poker game, but he just isn’t having a very good week. This is a western comedy (which I’m not sure if I’ve ever seen any other examples of before) and it’s a lot of fun. Mel Gibson has impeccable comic timing as Maverick, Jodie Foster is endearing as the incorrigible thief Annabelle, and those two actors really make the movie work. Some popular western tropes are subverted (lovingly) – the writer of the movie also wrote The Princess Bride, and there’s a lot of the same charm. Plus there are a lot of cameos and references to other movies – my favorite was when Danny Glover (Mel Gibson’s partner in the Lethal Weapon series) showed up briefly. Peter Berg’s second movie of 2016 about a real-life disaster starring Mark Wahlberg (after Deepwater Horizon), Patriots Day tells the story of the 2013 Boston Marathon bombing. I actually lived an hour away in Providence when this happened, but I knew very little about it because I was in India visiting my parents at the time and I missed most of the real-time coverage. The movie tells the story well, we see events from a few different perspectives – bombing victims, police officers, and the victims of the aftermath when the bombers fled. It’s formulaic, but it makes you sympathize with the situation without trying to tell you how to feel by focusing on melodrama. I read about the real events afterwards, and it seems the movie actually stayed very faithful to the facts, which I appreciated. Jodie Foster’s directorial debut is about seven year old child prodigy Fred Tate who is torn between his mother (Jodie Foster), who is loving can’t understand his mind and the founder of an institute for gifted children (Dianne Wiest), who gets him intellectually but is neurotic and stiff otherwise. Both women care for Fred, but have very different approaches to dealing with him, sort of like the central conflict of A Bronx Tale. Unlike A Bronx Tale, though, the movie is not about the kid, it’s about the women’s journey to growing to be able to provide Fred with both an emotionally stable and intellectually challenging environment. I liked most of the movie quite a bit, but I thought the ending was too neat and oversimplified a complicated situation. I thought the kid playing Fred did a terrific job, though. Eleven year old Mark Sway and his younger brother Ricky are playing in the woods when they stumble into a famous mafia lawyer who is committing suicide, but not before he tells Mark the location of a recently murdered senator’s body. Suddenly Mark becomes the recipient of a whole lot of attention – from the ambitious district attorney who is determined to convict the mobsters, from the mob who wants to silence him before he says anything, and from reporters. This movie is based on the John Grisham book of the same name, and John Grisham movies are a genre of their own (I’ve seen The Firm, The Rainmaker, A Time to Kill, Runaway Jury, and The Pelican Brief so far) – they’re thrillers with over-the-top plots and melodramatic characters, usually involving lawyers. The Client fit that mold very well, with some great performances by Susan Sarandon as inexperienced lawyer Reggie Love and Brad Renfro in his film debut as Mark Sway. I’m always looking for new, good, science-fiction films, so I was excited to read about the Netflix original film The Discovery in an Ars Technica article. Robert Redford’s in it, plus I enjoyed both director Charlie McDowell’s first movie The One I Love, and the last Netflix original science fiction movie I watched (Spectral), so I figured The Discovery would be pretty good. Unfortunately I was wrong and this movie is terrible. Movies that deal with metaphysics can be amazing, but this movie seems to think it’s being profound when it’s actually incredibly trite. The dialogue is awkward at best, and the two main romantic leads have no chemistry. In fact, everyone’s acting seems stiff and wooden. Hopefully this isn’t the standard that Netflix is setting for their original movies.